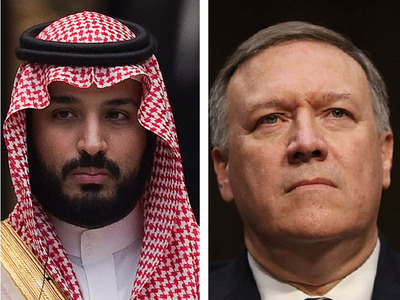 Getty Images/Business InsiderSaudi Crown Prince Mohammed bin Salman and US Secretary of State Mike Pompeo. The US has pledged “appropriate actions” against the people it has connected to the killing of the journalist Jamal Khashoggi. Pompeo said the US was already revoking visas and mulling sanctions. President Donald Trump on Tuesday described Khashoggi’s killing at the Saudi Consulate in Istanbul as one of the worst cover-ups in history. The president said he would leave the decision to punish the kingdom with Congress. The US has pledged “appropriate actions” against those responsible for the journalist Jamal Khashoggi’s death. Khashoggi, a green-card holder who lived in Virginia, was killed during a visit to the Saudi Consulate in Istanbul earlier this month. Riyadh has acknowledged that Khashoggi was killed but claimed it was the result of an altercation gone wrong as part of a “rogue operation” unknown to the Saudi leadership. Many, including US President Donald Trump, have expressed scepticism about the kingdom’s changing narrative on the matter and have called for those responsible to be held accountable. On Tuesday, US Secretary of State Mike Pompeo told reporters at the State Department that the US was already preparing action against several people it had linked to the killing. “The State Department will continue to seek all relevant facts, consult with Congress, and work with other nations, and work to hold accountable those responsible for the killing of Jamal Khashoggi,” he said. “The administration is also taking appropriate actions now, given the information currently available to the United States. These actions include revoking visas for people and the possibility of sanctions against the kingdom. Twenty-one Saudis will have their US visas revoked or will be made ineligible for future visas, the State Department spokeswoman Heather Nauert said Tuesday. “Still, we’re making very clear that the United States does not tolerate this kind of ruthless action to silence Mr. Khashoggi, a journalist, through violence,” he said. Pompeo said the US would “continue to maintain a strong partnership” with Saudi Arabia. “Neither the president nor I am happy with this situation,” he added. Trump on Tuesday described Khashoggi’s killing as one of the worst cover-ups in history, though he said he would leave any decision to punish the kingdom up to Congress. For Trump’s part, he has stopped short of promising action against Saudi Arabia or its leadership, which has tried to distance itself from Khashoggi’s death. The US president has made clear that his mind is also on a pending arms deal with the Saudis, which he has expressed concerns of jeopardizing.